Human beings can enrich biodiversity without doing much. Take raising dogs as pets, for example. A study says dogs have helped in the evolution of black colour in wolves. This bodes well for wolves inhabiting fast depleting snow-covered northern environments like the Arctic tundra. While hunting, the dark colour helps them merge with surroundings. Using genetic analysis of grey wolf populations from North America, a team of biologists traced the source of the gene to domesticated dogs. They concluded that the trait resulted from mating between the original grey wolf species (Canis lupus) and their canine relatives, the dogs, which had obviously strayed into the wolves' hunting grounds.The study, published in the February 5 edition of Science, showed that wolf populations are adapting to changing climatic conditions by taking advantage of human intervention. Methane, an important constituent of cooking fuel, can now be manufactured in large quantities. All we need is a nanotube catalyst, carbon dioxide, water and lots of sun. Materials scientists used titanium dioxide to create nanotubes about 135 mm wide and 0.1 mm long. They filled steel tubes with carbon dioxide and water vapour covering the ends of the containers with a film of nanotubes. When sunlight fell onto the nanotubes, water and carbon dioxide combined to form methane. The devices generated roughly 160 microlitres of methane per hour per gram of the nanotubes. The rate was 20 times higher than what was obtained from previous experiments. This method can not only be an important generator of fuel but it might also help control emissions by using carbon dioxide from sources like a coal plant. The findings were released in the February 5 issue of Nature. As nitrogen is to crop plants, iron is to aquatic life. So far this iron was believed to be washed down to the sea by rivers. 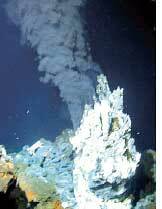 A team of oceanographers discovered iron that comes from fissures in the deep sea floor and is captured by organic compounds. This prevents the iron from rusting. It is also better metabolized by aquatic organisms. This research proves that life at the surface is linked to events happening at the extreme bottom. More studies are required to gauge exactly how much of the iron taken up by aquatic life is released by the sea floor. The study was published in the February 8 issue of Nature Geoscience. The risk of skin cancer is about to rise in countries like Australia, New Zealand, Argentina and Chile. A study busts the myth that global warming does not affect ozone recovery. Greenhouse gases bring about changes in wind patterns. The study shows that global warming has caused air circulation in the stratosphere (ozone layer) to increase in countries in the southern hemisphere. Quicker the air moves through the ozone layer, slower the ozone gets formed thus stalling its recovery. The projections also revealed that countries in the northern hemisphere will be least affected. More studies are required to measure the varying impacts of global warming on countries across the globe. The study was published in the February issue of Geophysical Research Letters. The popularity of soft drinks increases year after year. So does the number of health problems related to it. Previous studies linked it to obesity and osteoporosis. A new finding by researchers says it increases risk of kidney damage in women. The study, published in the October 17 edition of PLoS ONE, established a direct link between an increase in these diseases and the high consumption of fructose corn syrup, the sweetener used in sodas. Women who reported drinking two or more sodas within 24 hours were 1.86 times more likely to have albuminuria--a disease in which the kidneys are unable to filter out albumin (large protein molecules). The study did not find men at risk, the reason for which is unclear. Further studies are required. The ability of a wasp to parasitize insects like moths keeps them from destroying crop fields. A study reveals that it is a virus which helps these wasps succeed as good parasites--thanks to gene swapping between the wasp and the virus. The wasp injects the polydnavirus along with it's eggs into the insect's caterpillar. The virus weakens the immunity of the caterpillar which then acts as a storehouse for the wasp. At the same time the virus itself cannot replicate in the host's body because it lacks the necessary genes. The wasp has a part of the virus genome, controlling its replication. When the wasp produces eggs, it allows the virus to replicate so it could be injected in sufficient numbers into the caterpillar's body. The study was published in the February 13 issue of Science.